What Works for Plantar Fasciitis? What Doesn’t? Why? Tried everything? Maybe not yet. Plantar fasciitis can be stubborn, but many people have never even heard of the best treatment options. Most people recover from plantar fasciitis with a little rest, arch support (regular shoe inserts or just comfy shoes), and stretching, but not everyone: plantar fasciitis can be more stubborn than a cat that wants out. Severe chronic cases can stop you in your tracks, undermine your fitness and general health, and drag on for years. This deep-dive tutorial is for patients with serious and stubborn plantar fasciitis, and the professionals trying to help them. 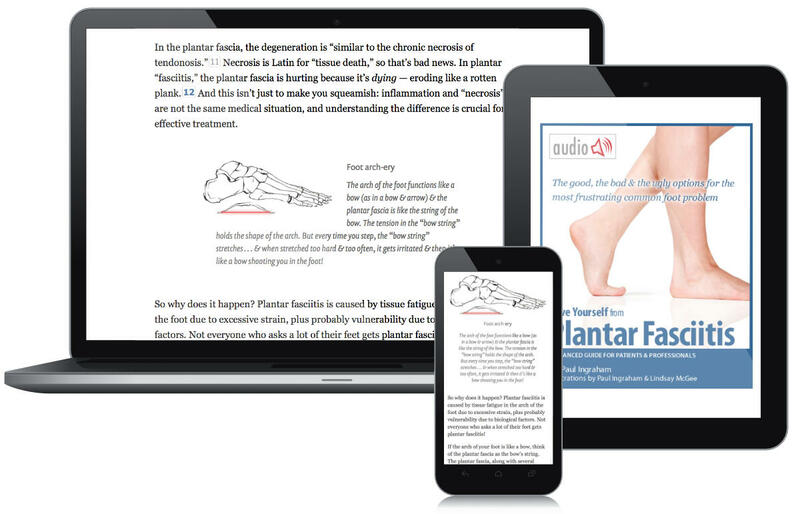 This is a book-length tutorial covering every aspect of plantar fasciitis: the nature of the beast (etiology), diagnosis and related conditions, prognosis and worst case scenarios, and more than two dozen reviews of treatment options. It concludes with plenty of specific advice, but there are no miracle cures. Scientific rigour and currency is a high priority. This page has been regularly updated for 14 years (last update Mar 24, 2019, jump to update log). I started writing about plantar fasciitis because I have my own mild but incurable chronic case, due to a weird foot bone (more on this below); I also saw many stubborn cases of it in my own patients. Misconceptions about plantar fasciitis have been spread far and wide, thanks to the miracle of the internet!1 Most of the information Dr. Google provides about plantar fasciitis is simply repetition of the same tired conventional wisdom, much of which is just wrong. If only! A foot rub is nice & in fact it can help a little, but massage therapy is actually one of the least effective of the common therapies for plantar fasciitis. But even podiatrists (foot doctors) — especially in North America, where podiatrists are mostly focused on surgical procedures — are not a great choice. They often give poor quality advice about chronic repetitive strain injuries like plantar fasciitis, iliotibial band syndrome, or shin splints. A few take a special interest in these conditions, but most do not, and the occasional tough case of plantar fasciitis is not on their radar — understandable but unfortunate. Physical therapists are the overall best bet for good plantar fasciitis care in my opinion, but often still lack the experience they need for tough cases, and physical therapy is generally far less scientifically rigorous than you’d think, and still peddles a lot of 20th century “high tech” snake oil (like ultrasound). About footnotes. There are 193 footnotes in this document. Click to make them pop up without losing your place. There are two types: more interesting extra content,1Footnotes with more interesting and/or fun extra content are bold and blue, while dry footnotes (citations and such) are lightweight and gray. Type ESC to close footnotes, or re-click the number. I’ve just used the familiar terms “tendinitis” and “inflammation” of the “fascia” to introduce plantar fasciitis in the most conventional possible way. But these are misleading terms and the truth is trickier. The name plantar fasciitis suggests a specific problem with a specific tissue — inflammation of the plantar fascia — but that is actually so uncertain that the condition should probably just be called plantar heel pain7 or maybe the even more imprecise plantar foot pain (because some people have more arch than heel pain). All these possibilities will be discussed below, but fatigue of the plantar fascia is definitely the dominant theory, baked right into the popular name for better or for worse, and so that is where we’ll begin. The plantar fascia is not really a tendon: it’s a sheet of connective tissue (“fascia”), more like a ligament than a tendon. It stretches from the heel to toes, spanning the arch of the foot, from bones at the back to bones at the front (whereas tendons connect muscles to bones). The “itis” suffixes in tendinitis and fasciitis mean “inflammation,” but the tissue is rarely inflamed the way we usually understand it (maybe at first, not for long). Instead, the plantar fascia shows signs of collagen degeneration and disorganization. In 2003, Lemont et al looked at 50 cases and found so little inflammation that they declared that plantar fasciitis “is a degenerative fasciosis without inflammation, not a fasciitis.”8 So it would be better to use a more generic suffix — like opathy (diseased) or osis (condition). In the plantar fascia, the degeneration is “similar to the chronic necrosis of tendonosis.”11 Necrosis is Latin for “tissue death,” so that’s bad news. In plantar “fasciitis,” the plantar fascia is hurting because it’s dying — eroding like a rotten plank.12 And this isn’t just to make you squeamish: inflammation and “necrosis” are not the same medical situation, and understanding the difference is crucial for effective treatment. The arch of the foot functions like a bow (as in a bow & arrow) & the plantar fascia is like the string of the bow. The tension in the “bow string” holds the shape of the arch. But every time you step, the “bow string” stretches … & when stretched too hard & too often, it gets irritated & then it’s like a bow shooting you in the foot! And why would a plantar fascia degenerate? Plantar fasciitis is caused by tissue fatigue in the arch of the foot due to excessive strain, plus probably vulnerability due to biological factors. Not everyone who asks a lot of their feet gets plantar fasciitis! If the arch of your foot is like a bow, think of the plantar fascia as the bow’s string. The plantar fascia, along with several muscles both in the foot and in the leg, supports the arch and makes it springy.13 Too springy, and the foot flattens out, overstretching the plantar fascia. Not springy enough, and the plantar fascia absorbs too much weight too suddenly. Either way, it starts to burn with the strain. Other than the fact that it’s on the bottom of your foot and you step on it a lot, why is the plantar fascia vulnerable to strain? Why exactly? What happens? Getting to the root of plantar fasciitis: could it be bone spurs? Clever-sounding biomechanical explanations for plantar fasciitis are as common as plantar fasciitis itself. Many therapists and articles on the internet will insist that you must treat the “root cause” of plantar fasciitis. It would certainly be a good idea — there’s no disputing that. Now, if only it were possible to identify the root cause! Surely hard bony growths in the arch are painful?! Bone spurs on the heel (aka heel spurs and calcaneal spurs) seem like they must be a smoking gun — a simple and obvious cause of plantar fasciitis. They are common — about 10–20% of the population14 has an extra bit of bone growing on the front of the heel. They often get the blame for plantar fasciitis because it seems so obvious that having a bony outcropping on your heel would indeed cause heel pain, for much the same reason that you wouldn’t want a rock in your shoe. Even more damning: they are indeed found more in people with plantar fasciitis than without. Not as bad as it looks. Having a bone spur is more like stepping on a cracker than a nail. A very thin cracker. Unfortunately for common sense, bone spurs aren’t very bone-y, and it’s not like having a rock in your shoe. Spurs are a slight calcification of the plantar fascia, brittle and thin. It’s as much like bone as tinfoil is like sheet metal. They make the back part of the plantar fascia a bit crispy and crunchy.15 So bone spurs aren’t nearly the serious mechanical problem they seem to be. Stepping on them is more like stepping on a cracker than a nail. A very thin cracker. Though once synonymous with plantar fasciitis, calcaneal spurs have, for several decades, largely been regarded in the orthopaedic literature as incidental findings. However, it may be premature to completely dismiss the significance of plantar calcaneal spurs. It’s clear that spurs are probably more painful and problematic when other tissue X factors are present, but those factors can and do also cause plantar fasciitis symptoms whether you have a heel spur or not — and heel spurs may be completely painless without those factors! Of all the possible “root causes” of plantar fasciitis, bone spurs superficially seem like the simplest and most obvious — and yet it’s neither. As tempting as it is, it turns out that you just can’t count on a nice straightforward connection between heel spurs and plantar fasciitis. Other alleged root causes are even less satisfying. Maybe it’s my pronation? Or flat feet? “My therapist said I’m a pronator.” I hear this a lot. It’s not clear that it matters. [Overpronation] contributes nothing to our understanding — it is not definable, not reliable or valid, not diagnostic, its relationship to injury is not fully understood, and it does not dictate what the most appropriate management plan may be. It should not be replaced, it should be removed. ~ Ian Griffiths, Overpronation: Accurate or Out of Date Terminology? For years, I incorrectly told plantar fasciitis clients with high arches that they were exceptional, because I knew only the conventional wisdom: plantar fasciitis afflicts the flat-footed. But obviously the plantar fascia can also be irritated by a too-tall arch.27 This is a Goldilocks case: the arches need to flex and give just the right amount — not too little, and not too much. Pronation is one side of a Goldilocks equation too. The truth is that excessive supinating — rolling outwards — is probably just as much of a problem28 — but that gets almost completely ignored. You never hear about supinating. If you walk in a shoe store and their sole basis for choosing a shoe for you is how much your pronate and what your arch looks like, turn around and walk out the door. The science simply does not support this protocol. As much as the body likes things to be just right, it’s also super adaptable. Many flat-footed pronators and high-arched supinators in fact do not have plantar fasciitis. And many people who do have plantar fasciitis have completely normal arches, and neither pronate nor supinate excessively. Arch height and pronation are probably risk factors … but not the most important ones, and not root causes. Probably my calves are too tight! But hold on to your muscle tone, because it turns out that it’s amazingly difficult to even define “tight calves,” let alone blame them for plantar fasciitis. Why? Purchase full access to this tutorial for USD$1995. Continue reading this page immediately after purchase. See a complete table of contents below. Most content on PainScience.com is free. ?Almost everything on this website is free: about 80% of the site by wordcount (well over a million words), or 95% of the bigger pages (>1000 words). This page is only one of 8 big ones that have a price tag. There are also hundreds of free articles. But this page goes into extreme detail, and selling access to it keeps the lights on and allows me to publish everything else (without ads). A. There is no paper book. I sell digital reading material only: web-based tutorials, and audio — for instant delivery, and many benefits “traditional” e-books can’t offer, especially hassle-free lending and free updates for life. Health care information changes fast! You get free lifetime access to the always-current “live” web version and offline reading is no problem. A. Yes: the design and technology of the book is ideal for reading on tablets and smart phones. You can also print the book on a home printer. Or listen to the audiobook! To unlock all 67 sections, buy this tutorial for $19.95. You’ll receive the full version instantly. 2.2 Getting to the root of plantar fasciitis: could it be bone spurs? 2.3 Maybe it’s my pronation? Or flat feet? 2.4 Probably my calves are too tight! 2.5 So what if you are a flat-footed, tight-calved pronator? 2.9 Plantar fasciitis in the bone? 2.14 What’s the worst case scenario for your plantar fasciitis? How do you know you’ve got plantar fasciitis? 4.1 So what’s the plan? 4.6 Surgical options for plantar fasciitis: so many! •4.10 Icing: more is better? 6.3 What’s new in this tutorial? Unsurprisingly, a lot of plantar fasciitis information on the Internet is shallow repetition of basic conventional wisdom, much of which is just wrong. While the quality of online information has been gradually improving, it’s still mostly just obsolete basics or gurus pushing crank theories and miracle cures. There are no miracle cures for sale here. If there was actually a reliable, proven treatment method for plantar fasciitis, I’d just tell you up front, and so would lots of other people, and this book wouldn’t need to exist. It’s point is to help patients and pros sift through all the half-baked theories and imperfect treatments. It’s purpose is to educate. There’s not much here that can’t find somewhere else if you do enough Googling. But this is a one-stop shop, everything in one place, from an author who has spent years evaluating this stuff. And living with the condition, too! I have a mild but incurable case of plantar fasciitis: I can’t recover fully because it’s caused by a minor foot deformity, a slight twist in my foot bones. But this also gives me a great opportunity to perpetually test treatments: every time it flares up again, I get to try again! So I’ve tried most of them personally, and I do quite well controlling it. So I know from both personal and professional experience that the prognosis isn’t always good. When the going gets tough, patients need to know their options inside and out. I can’t promise a cure for your foot pain — no one ethical can — but I can guarantee a deep understanding of the subject. Really interesting reading. I quickly found information I haven’t seen anywhere else, and it was referenced. No one has ever even suggested that lower leg muscles might be involved. I’ve often wondered about that. I’ve been practicing in podiatry for 16 years and I have successfully treated thousands of cases of plantar fasciitis. The condition is often misunderstood, and there are a myriad of theories out there, but this tutorial is one of the best things I’ve read on the subject; it provides an excellent overview of the latest treatment and self-treatment options, and makes sure that patients know when to see a medical professional. The crucial point Paul makes that I would like to back up is that plantar fasciitis can be successfully treated, but often requires multiple therapies and persistence. Thank you! There is more and better information here than anywhere else I found. What a relief to have a truly comprehensive resource. I was so sick of reading all the same old basic advice. It was (almost literally) killing me that I couldn’t walk. I’d gained weight, morale was very low. Thanks a million for this article, it’s so much more informative than anything else I could find it’s just crazy. Why isn’t this information more available? I came across your article about plantar fasciitis and you have managed to diagnose what my doctor could not. Impressive! Many thanks for publishing your clear and concise explanation. Regular updates are a key feature of PainScience.com tutorials. As new science and information becomes available, I upgrade them, and the most recent version is always automatically available to customers. Unlike regular books, and even e-books (which can be obsolete by the time they are published, and can go years between editions) this document is updated at least once every three months and often much more. I also log updates, making it easy for readers to see what’s changed. This tutorial has gotten 87 major and minor updates since I started logging carefully in late 2009 (plus countless minor tweaks and touch-ups). 2014 — Major update: The first complete professional editing of this book has now been completed. Although the difference will not be obvious to most readers, several hundred improvements and corrections were made, and it is definitely a smoother read. 2013 — Product upgrade: Audiobook version now available. 2011 — Major update: Major improvements to the table of contents, and the display of information about updates like this one. Sections now have numbers for easier reference and bookmarking. The structure of the document has really been cleaned up in general, making it significantly easier for me to update the tutorial — which will translate into more good content for readers. Older updates — Listed in a separate document, for anyone who cares to take a look. Chandler and Kibler report a 10% occurrence rate of plantar fasciitis in runners. The authors quite correctly point out that there are several possible causes of the condition that have nothing to do with the plantar fascia, and none of them correlate cleanly with symptoms. So an imprecise label is really the only honest one. See also: one-minute video summary of this paper. High heels are often vilified, but this carefully done 2010 study showed that the body adapts effectively and minimally, producing quite similar functional results. The most interesting implication of their results is simply that “muscle structure may adapt to a chronic change in functional demand” — which might seem obvious, but that little bit of science has been hard to nail down over the years, and this is a good piece of the puzzle. Chronic heel wearers do have shortened calf muscles, stiffer Achilles tendons, and a smaller ankle range of motion, but these changes “seem to counteract each other since no significant differences in static or dynamic torques were observed.” In other words, high heel wearers are not progressively disabled: their ankles work fine, just differently. This doesn’t mean there’s no conceivable harm (for instance, Kerrigan found evidence of harm to the knees), but it does tend to downgrade concern on the topic. There are 162 more footnotes in the full version of this book. I like footnotes & I try to have fun with them whenever possible.